Claiming to offer ‘the ultimate riding experience in the most hauntingly beautiful place on this planet’ is pretty bold. 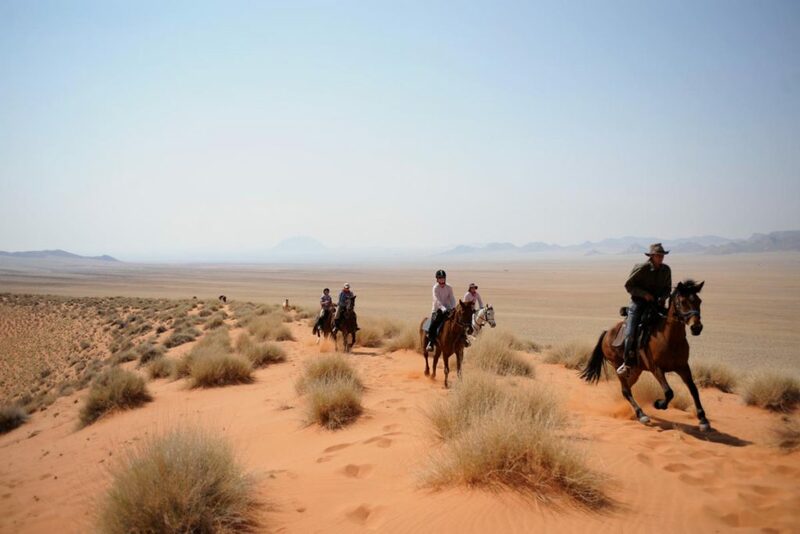 But that’s exactly the promise Namibia Horse Safaris make on their website. 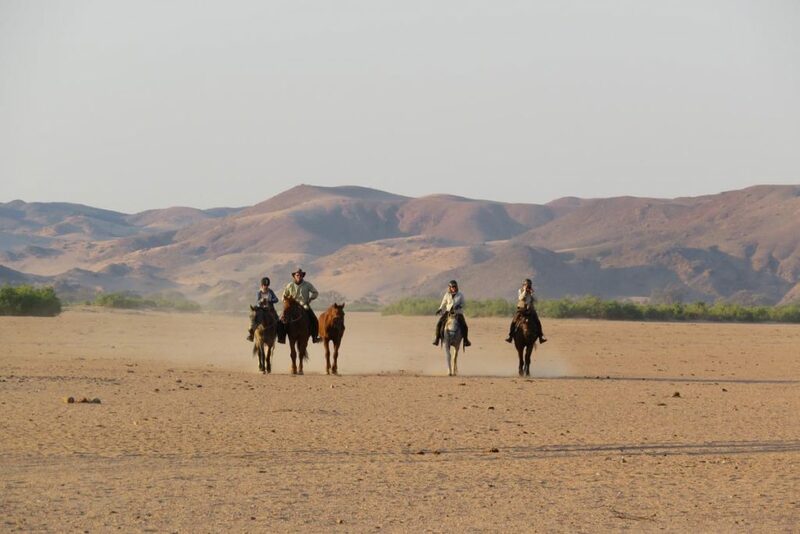 Would they, I wondered, as I joined their Damaraland ride a couple of months ago? The answer, absolutely yes – they deliver in spades. In 11 years with Aardvark Safaris I’ve travelled all over sub-Saharan Africa but little has come close to this in terms of an adventure and the sense of achievement in accomplishing what’s a pretty extraordinary journey. If you are a confident rider and fit enough to spend up to five hours a day in the saddle then it’s one to consider. 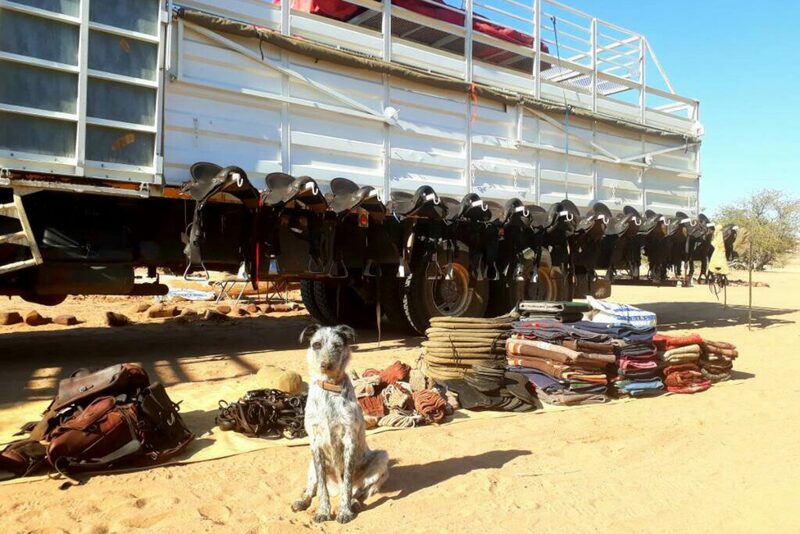 Co-owner, host and lead guide Andrew Gillies runs an incredible operation. His team is among the best I’ve encountered on a riding safari and they go a long way to making these safaris so successful. Andrew is an expert at matching guests to horses from the herd of 80 they run, and we were all besotted with our own at the end of the 380km trip. 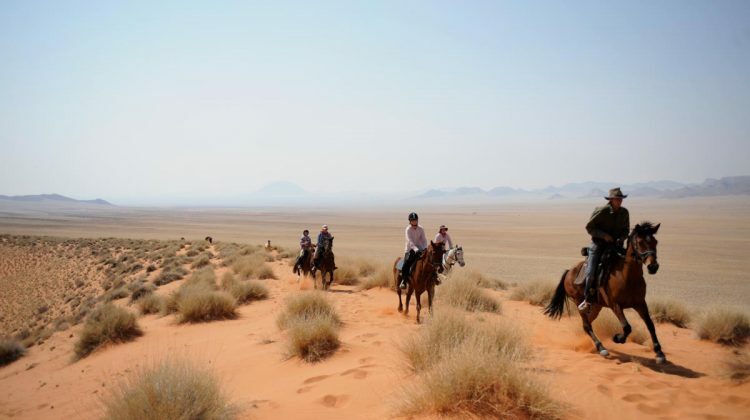 While you won’t see the wildlife you do in Kenya, Botswana or South Africa, the scenery more than compensates with terrain ranging from dry river beds, canyons and wide open plains, to dunes and ancient volcanic craters. There’s plenty of space for fast riding – the eight minute gallop on day three was a real highlight. If you’ve been to Namibia you’ll understand when I say the views are out of this world, if you haven’t then you need to go! We did see elephant and plains game in places and following lion tracks one morning was pretty exciting. Apart from the first and final night of the 10 day trip we slept under the stars (tents on hand if it’s really cold or rain is in the offing). That was a first for me. 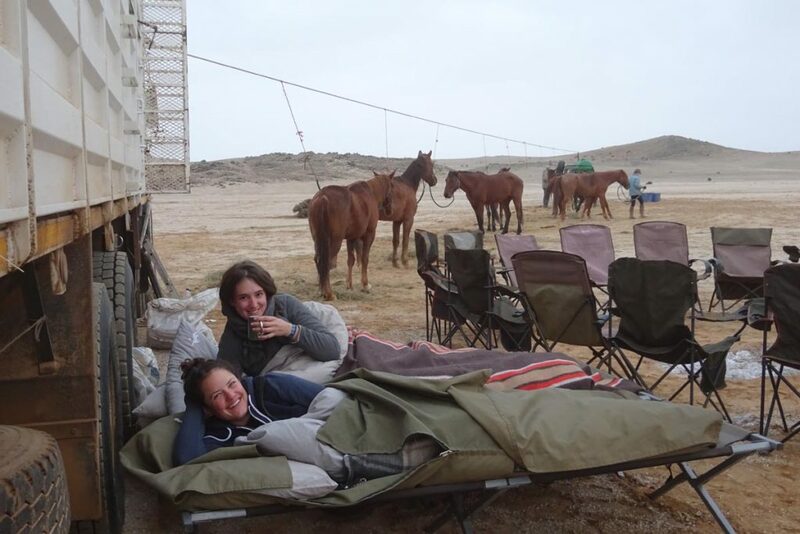 Comfy bedrolls with cozy duvets kept out the cold and gazing at the shooting stars in the brilliant night sky was incredible. For such a remote trip everything worked very smoothly. A huge truck leaves base with the horses, food, water and equipment and on the couple of nights it couldn’t follow us, supplies were loaded onto 4x4s and camp was pitched from them. While not luxurious, we were very comfortable with good bucket showers and delicious safari food. After nine days riding through the desert, arriving at the Atlantic Ocean on our last day was quite emotional. It was almost as though a spell had been broken – we’d barely seen another person, had ridden through exquisite scenery and enjoyed time as a small group far removed from the real world. I think it’s probably the best mobile riding safari I’ve been on. Have a quick look at the video Andrew took while we were there – It really brings the whole thing to life. It all looked. fantastic and I am pea green with envy. Sadly we are too old now but is there a 4×4 alternative?! With perhaps a little riding? Your query has been passed onto one of our safari experts. Jo joined Aardvark’s Scottish office in September 2006, fresh from two ski seasons, and as a farmer’s daughter felt instantly at home with the chickens, ducks, sheep, dogs and horses that frequent Aardvark Scotland! 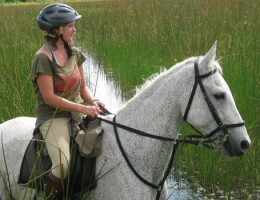 Animals and skiing aside, Jo’s passions include cooking, travelling, hiking and horse riding. Jo joined Aardvark’s Scottish office in September 2006, fresh from two ski seasons, and as a farmer’s daughter felt instantly at home with the chickens, ducks, sheep, dogs and horses that frequent Aardvark Scotland! 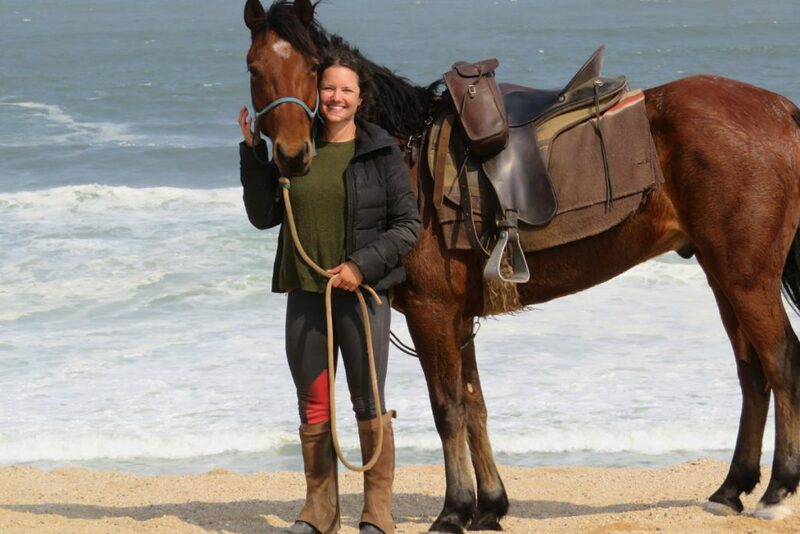 Animals and skiing aside, Jo’s passions include cooking, travelling, hiking and horse riding. She was a chalet manager in the Alps for two winter seasons, while the summers took her to the north of Scotland to cook for large house parties. As a child, Jo was fully immersed in the Fife Hunt pony club, and has more recently worked with top eventers and racehorses. She put her cooking skills to good use on a two month sabbatical in Uganda and Rwanda where she was tasked with improving the food and sourcing new ingredients in some of the top lodges. A highlight of her time here was tracking mountain gorillas on three occasions - Jo is therefore an excellent person to talk to about holidays here as she can give you her own honest and unbiased advice. 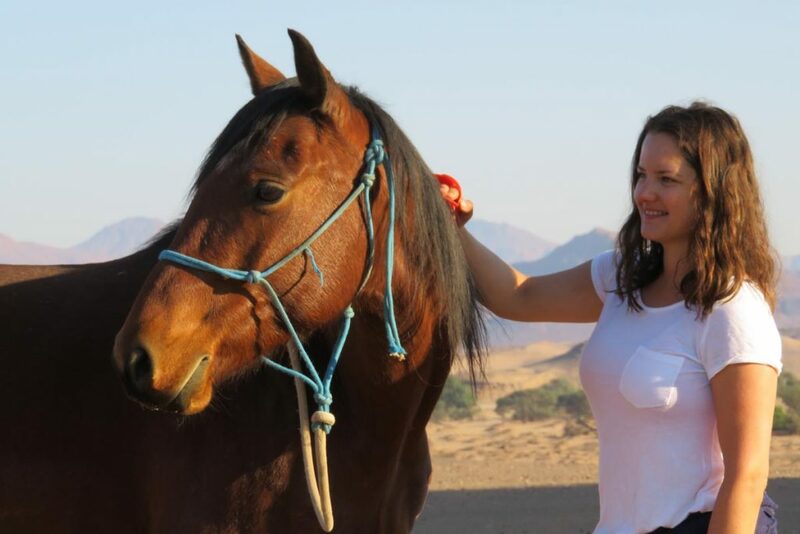 Now a senior sales consultant at Aardvark Safaris, Jo has been given the exciting challenge of managing a sales team. Sociable, outgoing, fun and very well-travelled, we believe she is the perfect person for the job. Based in Edinburgh, Jo is more than delighted to come and meet guests with maps and brochures, to chat their holidays over in person. Sleeping in a hide on the Boteti River in Botswana. There were elephant splashing around in the river and two prides of lion roaring to each other from opposite banks. I didn’t sleep a wink, but it was one of the most thrilling nights of my life! Making it to the summit of Kilimanjaro. Having that sense of satisfaction, whilst seeing the sun rise up through the clouds below, has to be one of the most magical things I’ve ever experienced. Giraffe – I have always wondered what it’s like to be tall……they’re the complete opposite of me; tall, graceful and quiet. 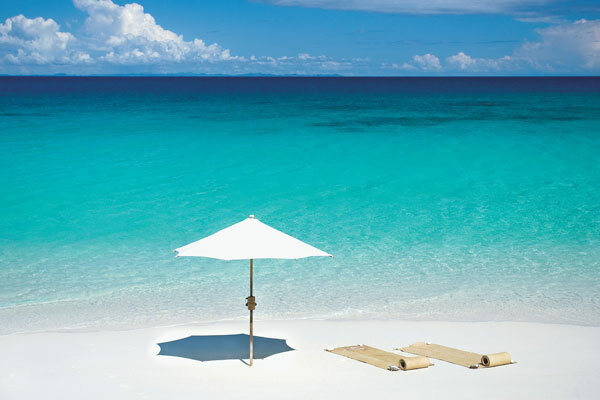 Tsarabanjina off the north west coast of Madagascar, for its truly remote location, sugary white sand, warm translucent water, and amazingly romantic and private bandas. 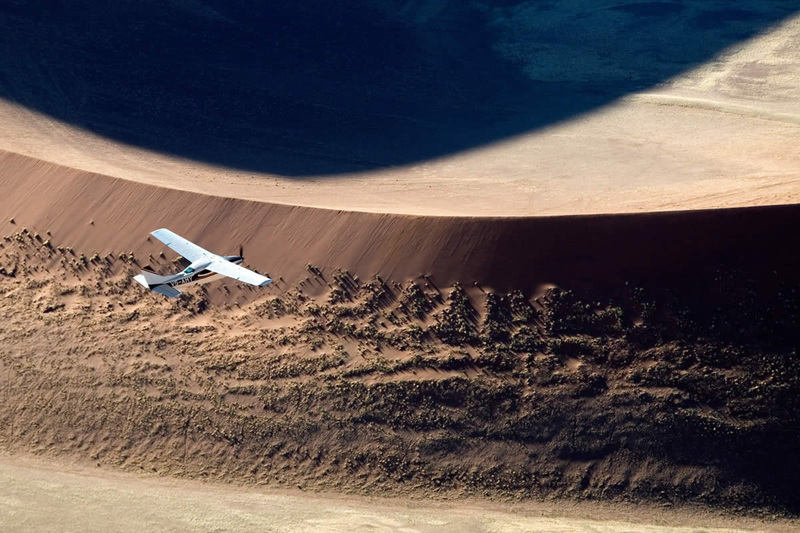 Schoeman Skeleton Coast Safaris’ Kunene Camp in northern Namibia. It’s on the border with Angola and is totally unique, simple and beautiful. 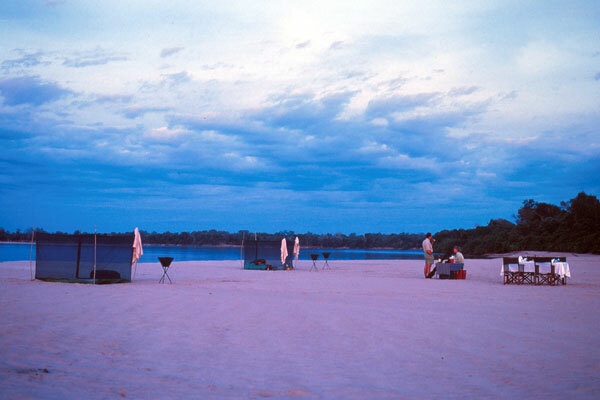 Sand Rivers in Tanzania’s Selous Game Reserve for its exclusivity, wonderful river location and the sound of hippos from any part of the lodge. Botswana, Kenya, Madagascar, Malawi, Mauritius, Mozambique, Namibia, Uganda, Rwanda, South Africa, Tanzania, Zambia, Zanzibar. There’s nothing better than speaking to guests who have just returned from a fantastic holiday. It gives me such a buzz. There’s plenty of room for error when planning these trips so it’s essential to get everything absolutely right and that’s where the first hand-knowledge and attention to detail comes in. I travel regularly, and though it’s a wonderful perk, it’s also crucial to help plan the perfect holiday. I take a lot of pride in trying to make all the trips I plan the best they can possibly be, no matter how long takes. Making people happy is very satisfying.